Active chapter president Patrick O'Connor '15, and Vice President Drew Nikolai '15, recently met with U of M sports legend Don Lund '45 to inform him about the newly established Harmon-Chappuis-Lund Award. The award will annually recognize the active chapter member who is most valuable to the success of Michigan Alpha's intramural sports teams competing in the U of M Fraternity League. Lund earned 9 varsity letters playing football, baseball and basketball at U of M. After graduation, he played professional baseball for the Brooklyn Dodgers, St. Louis Browns and Detroit Tigers. Following his career as a pro player, he was head baseball coach at U of M where he won the NCAA World Series in 1962. He was an assistant coach for the Tigers when they won the 1968 World Series. Lund went on to become the U of M Athletic Department Associate Athletic Director under legendary AD Don Canham. He was elected to the Michigan Hall of Honor in 1984 and Michigan Sports Hall of Fame in 1987. In 2013, the Michigan Alpha Alumni Association board of directors established the Harmon-Chappuis-Lund Award to honor three Michigan Alpha Men -- Tom Harmon '41, Bob Chappuis '48 and Don Lund '45 -- who brought great honor to the fraternity for their outstanding achievements in U of M athletics and careers after college. 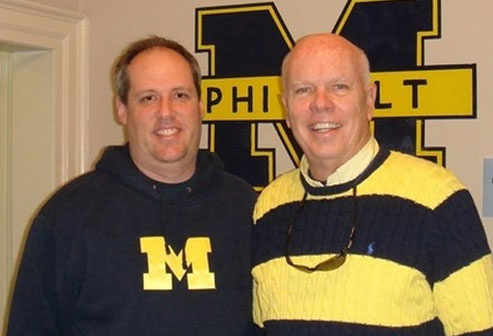 In addition, Harmon and Chappuis actively supported Phi Delta Theta throughout their lives, and Lund continues to do so to this day. The Alumni Association tasked the active chapter with the responsibility of nominating eligible men and choosing the winner of the award each year. The first recipient of the award was announced during the active chapter-alumni social event -- the Harmon BBQ -- during the day of the 2013 Michigan vs Notre Dame football game at which Harmon was named a "Michigan Football Legend" by the U of M Athletic Department. Zach Sprintz '15 was presented with this inaugural honor in recognition of his leadership as PDT's Intramural Sports Chairman during the 2012-2013 school year. Under Sprintz's direction, PDT won the 2012-2013 All-Sports IM Championship for the Fraternity League. This was Michigan Alpha's first championship since the 1984-1985 school year although PDT only narrowly missed this outstanding achievement a couple of times in recent years.